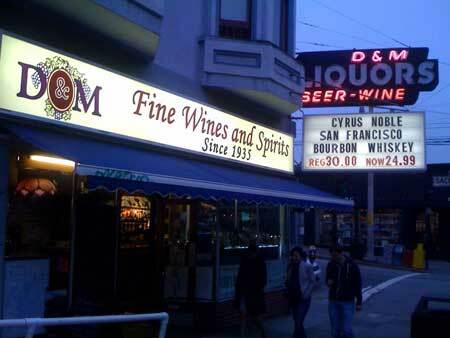 Cyrus Noble bourbon is on the marquee at D&M Liquors on Fillmore. A neighborhood icon with historic roots experiencing a renaissance — that was the cause for celebration in mid-July at the Elite Cafe. It was a 30th anniversary party for the Elite, held more than 80 years after its well-preserved Art Deco home first opened in 1928 as the Lincoln Grill. But the rejuvenated Elite and its renovated building are youngsters compared to another local institution sharing the spotlight at the July 14 bash. The evening also marked the return of Cyrus Noble bourbon, first served up 140 years ago by the Haas Brothers and now available again for the first time in decades. The Haas family came from Germany to San Francisco soon after gold was discovered and by 1851 was providing groceries and spirits to miners in California, Nevada and Alaska. Their relative Levi Strauss began making jeans. Things didn’t go so well for an unlucky miner named Cyrus Noble, who gave up his search for gold and returned to Ohio to work in a distillery, where he perfected his talent for tasting and blending. Legend says he became so intoxicated by his work that he fell into a vat of whiskey, which was promptly named for him. Cyrus Noble bourbon was christened in 1871 and soon brought to California by Ohio lawyer Ernest Reuben Lilienthal, who entered the wholesale liquor business and joined forces with the Haas family. The Haas-Lilienthal house on Franklin Street stands as one of many monuments to the families. Cyrus Noble whiskey became a favored spirit both among gold miners and in the parlors of the city’s finest homes. Vintage Cyrus Noble bottles can still be found in the pantry of the Haas-Lilienthal House. “This was their drink of choice,” says Burrows. But bourbon fell out of favor in the mid-20th century and the old-fashioned brand disappeared. A new century and a new appreciation for cocktails prompted Haas Brothers to reconsider its historic brand, and on June 28 the firm announced it was bringing back Cyrus Noble bourbon — just in time for it to be offered up for tasting at the Elite’s birthday party. Burrows says Cyrus Noble will be officially launched in the fall with a series of tastings at some of the city’s establishments that “have been around as long as we have.” Cyrus Noble is already available at some historic locales: Tadich Grill, Sam’s, the Gold Dust Lounge and the House of Shields. Locally it’s stocked at D&M on Fillmore Street, Cal-Mart in Laurel Village and Beverages & More stores. It is still a local brand. Many members of successive generations of the Haas family continue to live in the neighborhood, including the president of Haas Brothers, Cyrus Noble’s parent company: nearly 90-year-old Jane Burrows. She is the mother of Steven and his two sisters, who are all involved in the company, as are her seven granddaughters — and surely her three great-granddaughters won’t be far behind.